Is it just me or are the summers getting shorter? Even though this one lasted until 5:51 am est on September 23rd, it sure seemed like it went fast. I was working like a dog and did not get much of a chance to enjoy it. But I did make some art, and would like to present it to you on this little cyberpage. I hope you feel a tingle in your synapses as a result of what I was able to feel of The Muses. Word to Clio! 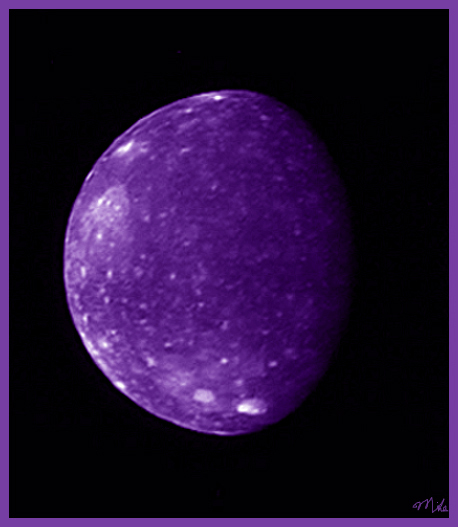 Thanks to the New Horizons team for the great b + w photo of Callisto that I artistically tweaked with color and saturation, et cetera. I will add a credit right on the photo soon like I did for "Iapetus." Speaking of Iapetus, thanks to the Cassini team for that one! I hope you will join your brothers and sisters over at New Horizons and support full planethood for Pluto, a planet that has as many moons as the four most-inner planets of our Solar System! Don't nix Pluto!